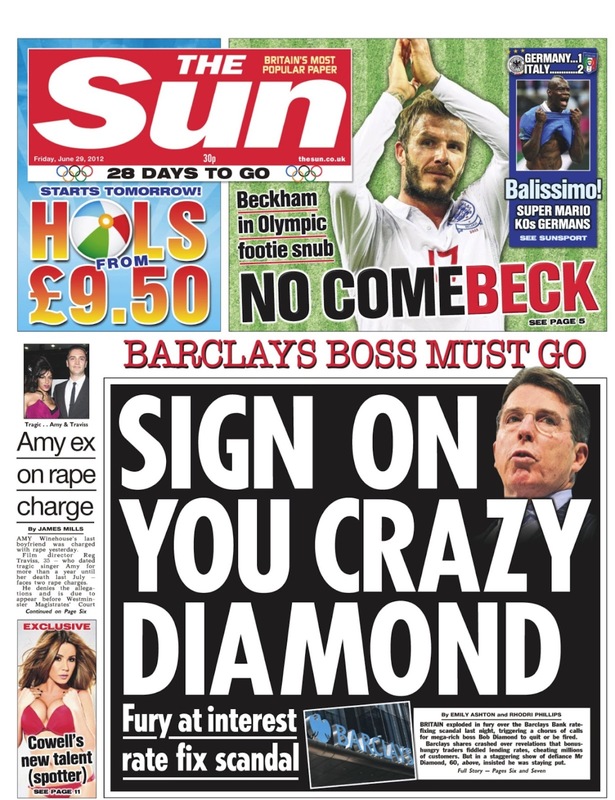 Here's another addition to the growing number of headlines based on song titles. 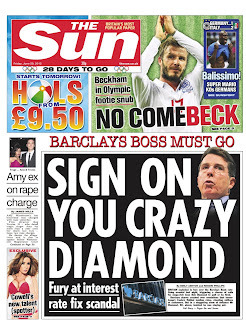 Clever - but how many Sun readers will get the Pink Floyd reference? A narrow band I suspect. If you have no idea what it all means, here's the original version of the song dedicated to the late Syd Barrett. 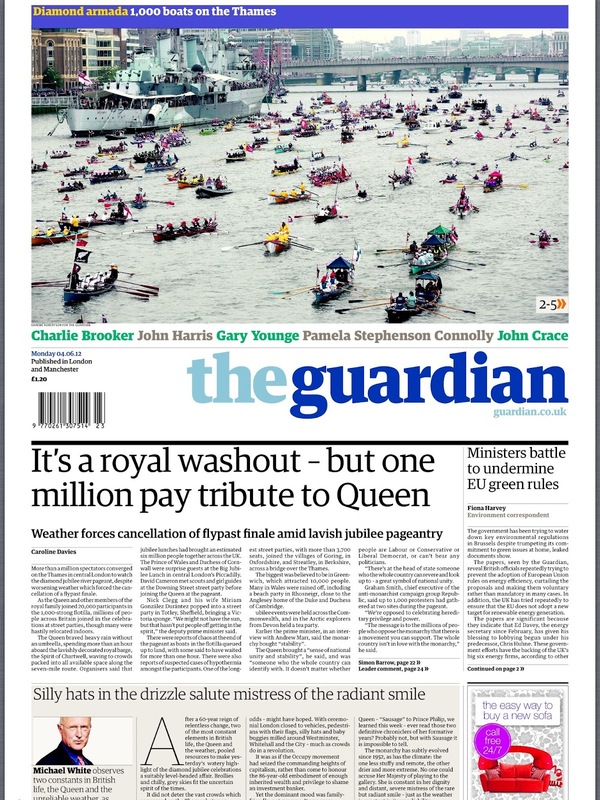 There were certainly plenty of pictures to choose from for today's front pages ... but writing the headlines was, it seems, a more challenging task. Even so, it is hard to believe the i opts for the ubiquitous 'Rain fails to dampen...' After the 50th time this appeared in my first local newspaper, the editor banned it (along with 'Blooming marvellous' on flower shows). Perhaps the paper was being ironic. 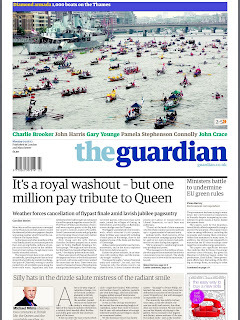 The Guardian's 'It's a Royal washout ...' isn't too original either. I like the picture sitting above the titlepiece though. 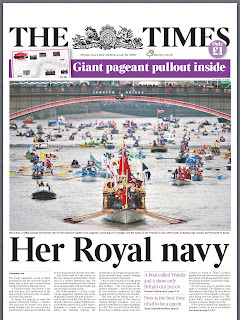 Is this the furthest down the page that a masthead has ever been? There are those who think this approach is marketing suicide but it looks pretty eye-catching to me. 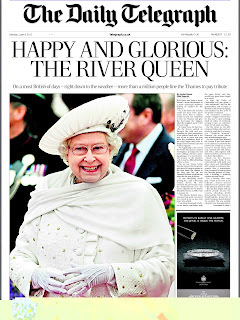 The Daily Telegraph takes the safe option with 'Happy and Glorious' and then bolts on a post-colon 'The River Queen.' A mix of a song lyric and a film title. A colon in a headline often suggests indecisiveness. I might have just gone for one, probably the film title. 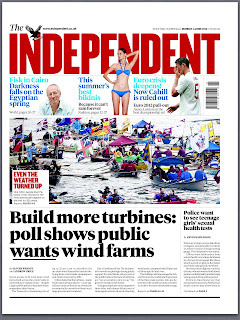 Another colon in The Independent which decides 'Build More turbines: poll shows public wants wind farms' is its best headline of the day. 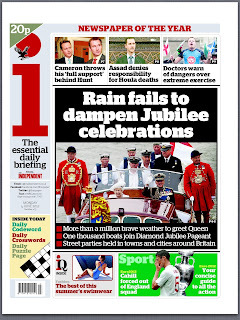 Given that its Jubilee headline is 'Even the weather turned up,' it is probably a good call. Good picture though. 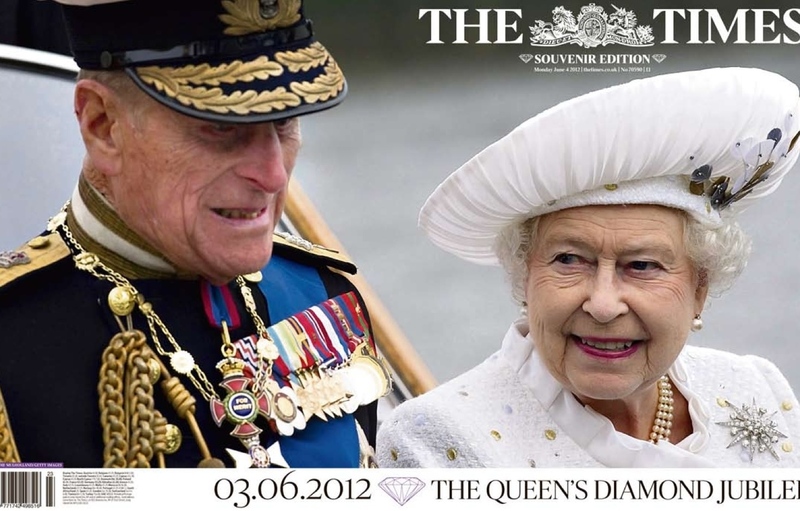 The Times has a wraparound which, on the newstands looks like a huge headshot of the Queen, along with the most understated front page headline of the day 'The Queen's Diamond Jubilee.' 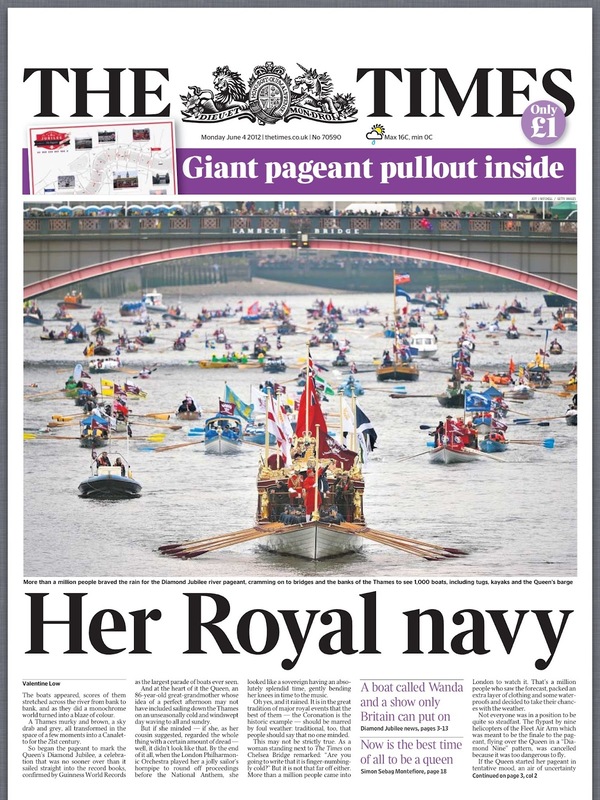 Inside the wrap is the paper with the headline 'Her Royal navy' which works nicely under a great photograph of the cluttered Thames. 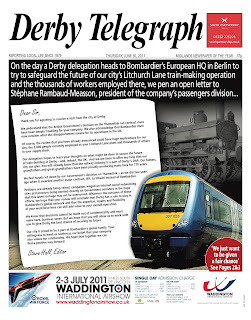 It is just a little unusual to have the wrap as well as a front page ... but it's an effective way of getting two display pages. 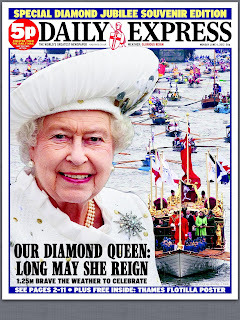 The Mail appreciates that it's all about the pictures and relegates the headline to the bottom right of the page. 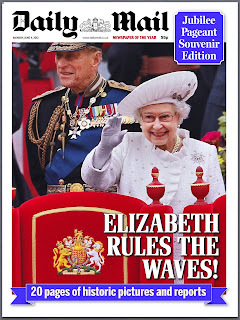 It opts for a harmless 'Elizabeth rules the waves' pun. Its back page though is spectacular ... no headline required. 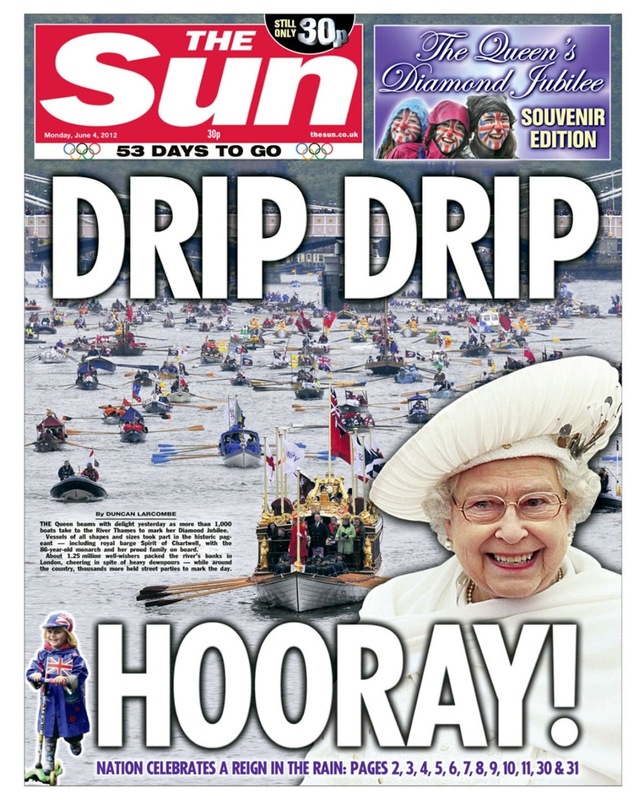 The red tops, predictably, come up with the best headline efforts. 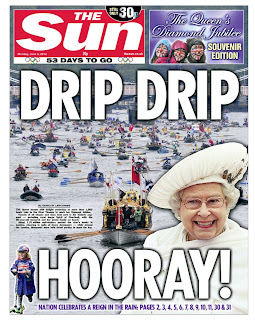 The Sun's 'Drip, drip hooray' manages to capture the gloomy weather angle without having to resort to the predictable puns. I think the Mirror edges it though. 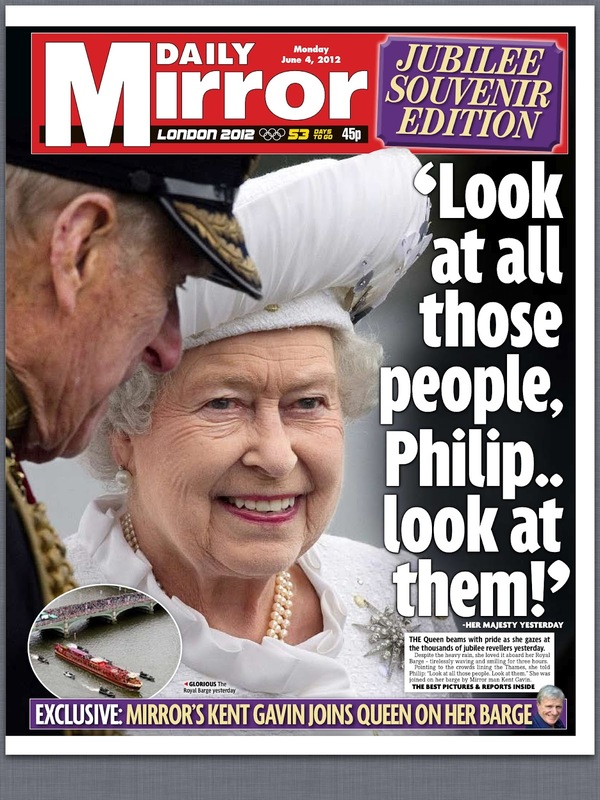 'Look at all those people Philip, look at them' captures the Queen's genuine surprise. 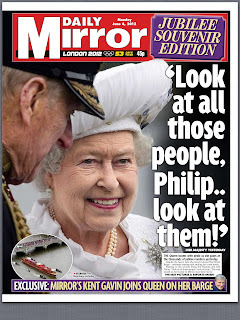 A first person quote is always a great option - especially when it's an off guard moment by the head of state. 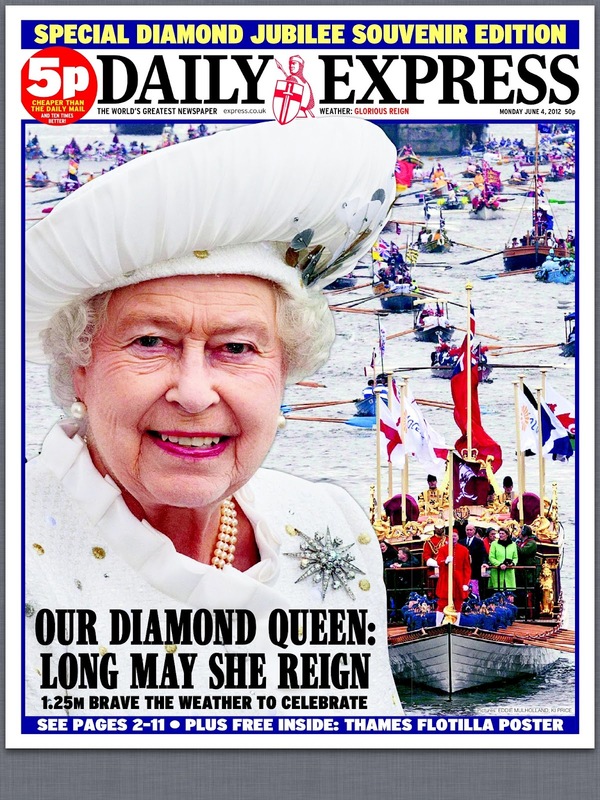 All in all some great pictures, but largely average headlines. 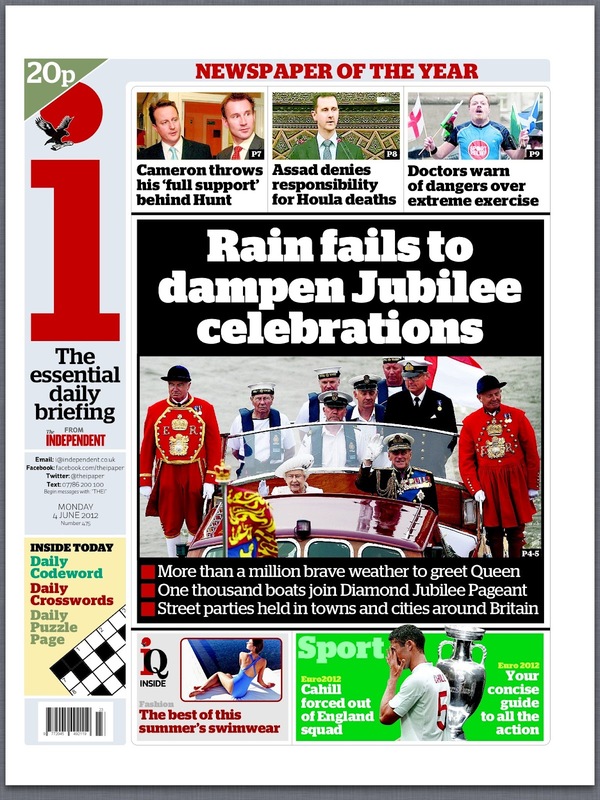 At least nobody used 'Long to rain over us ...' or 'Would Jubileeve it'. Running two headlines next to each other is always a risk ... but rarely have I seen three that read across. 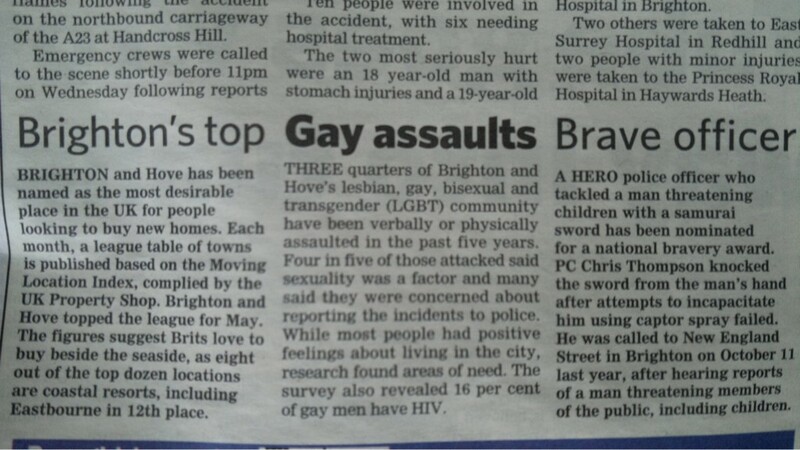 Many thanks to @SimonNRicketts for flagging this one up and @jcodfishpie who spotted it, observing that Brighton's top gay really ought to be ashamed of himself. 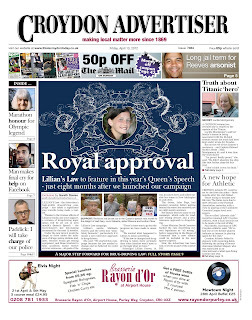 A belated congratulations to all the winners, and indeed all of those shortlisted, in the Regional Press Awards. It is the first time in a decade that I have not been there. I stood down as Chairman of the Judges this Year and was also out of the country on the day. 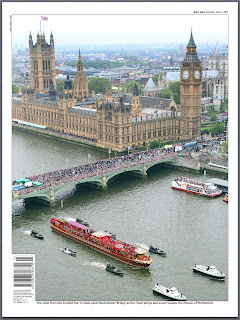 But my colleagues tell me it was a splendid celebration, so well done to Bob Satchwell, my successor Paul Horrocks and all those, not least the judges, who put in a massive amount of time to ensure this showcase of the best in regional newspapers continues to thrive. I was particularly pleased to see the Campaign of the Year nominations. For me this is the category that sums up what regional newspapers are about - making a difference to the communities they serve. There were five very strong nominations. 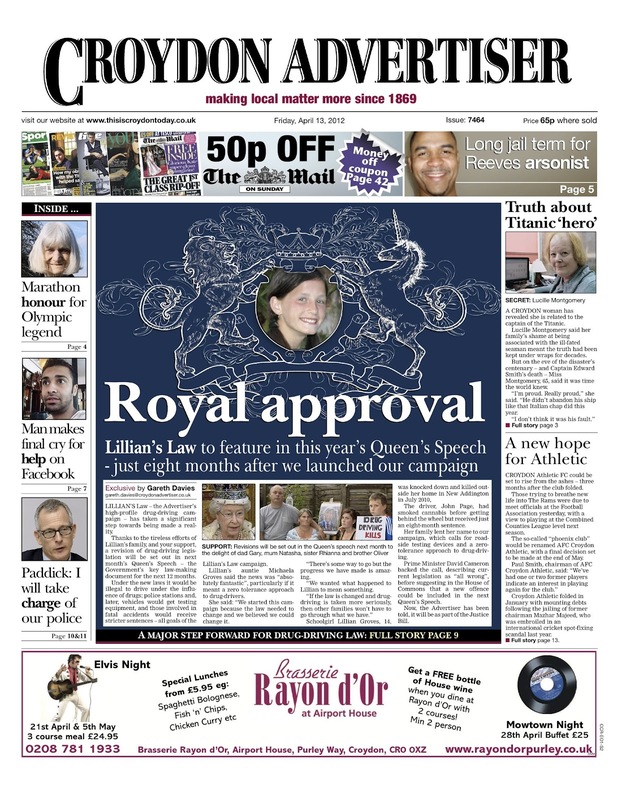 Another campaign that made a real difference was the Croydon Advertiser's Lillian's Law, launched after 14-year-old Lillian Groves was killed by a driver who had been smoking cannabis. Reporter Gareth Davies joined Lillian’s family to start the campaign after the driver was given just eight months in prison. The Advertiser called for new laws which would make roadside drugs testing compulsory and ensure tougher sentences for those causing fatal accidents as a result of taking drugs. 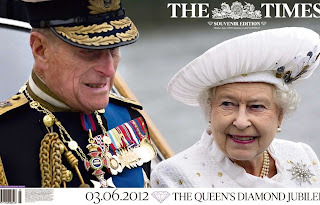 The campaign reached its goal when, in April, it was announced in the Queen's Speech that, under the Crime and Courts Bill, police will be equipped with handheld detection devices to test saliva at the roadside. 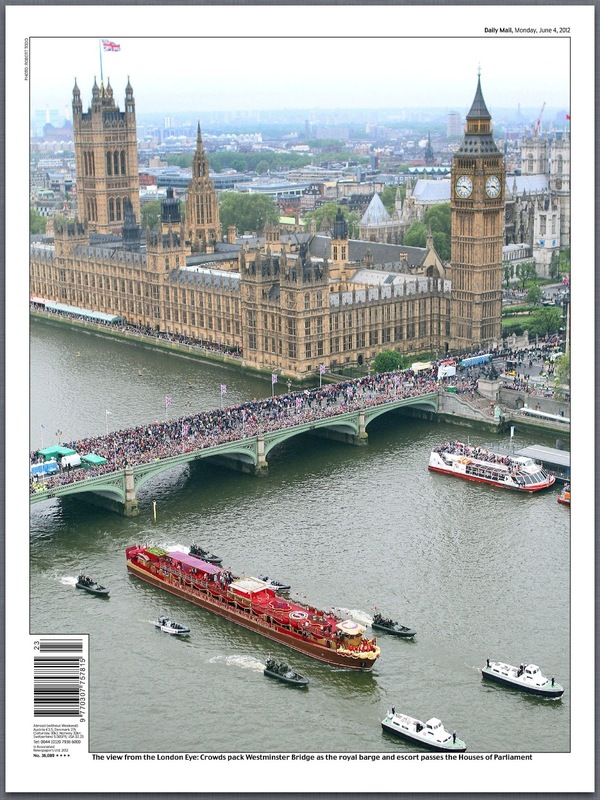 Well done to Gareth and to editor Glenn Ebrey. 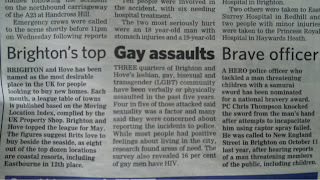 And this, of course, is what all local newspapers should be doing. As my old editorial director used to say, if you have an acquaintance who never has anything to say, always sits on the fence, never stands up for their friends, you will eventually stop inviting them round. So it is with newspapers. Fighting for the community and its individuals is one of our prime roles. 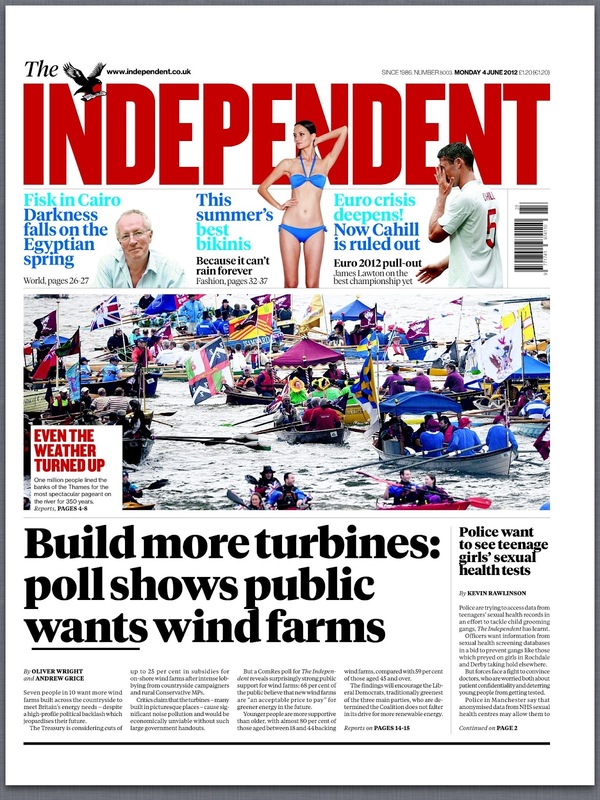 And anyone who doubts the influence of regional and local papers should ponder the impact of these, and the many other campaigns that our newsrooms constantly throw their weight behind. A big slap on the back to all the winners. From a personal point of view I am delighted for everyone but a special mention goes to the Northcliffe winners, who took almost half of the available awards. I was also pleased to see the Northern Scot win Weekly Newspaper of the Year (under 20,000). My colleague Mike Brough and I redesigned the paper last year and had a cracking time with the journalists of Elgin. Well done Mike Collins and his team.